Social Program with a Future: Big win for L. A. working poor. . .
David Shipler's The Working Poor: Invisible in America (New York: Alfred A. Knopf 2004) provides incredible insight into the lives of low-income working people in the United States today. Shipler's book and his research are the most important on the subject in the past 40 years. Central Dallas Ministries enjoyed having him as our guest speaker at our annual Urban Ministries Prayer Event two years ago. "Most of the people I write about in this book do not have the luxury of rage. They are caught in exhausting struggles. Their wages do not lift them far enough from poverty to improve their lives, and their lives, in turn hold them back. The term by which they are usually described, 'working poor,' should be an oxymoron. Nobody who works hard should be poor in America (p. ix). "Workers at the edge of poverty are essential to America's prosperity, but their well-being is not treated as an integral part of the whole. Instead, the forgotten wage a daily struggle to keep themselves from falling over the cliff. It is time to be ashamed" (p. 300). Shipler would be proud of the Los Angeles City Council. The legislative body approved a living wage ordinance for the 3,500 hotel workers employed in the Gateway Improvement District near L. A. International Airport. Eleven of the 14- member City Council voted recently to extend the city's 1997 living wage law to 3,500 workers in the LAX hospitality industry. The groundbreaking vote makes Los Angeles the largest city in the country to require employers that don't do business directly with the city to pay their workers a living wage. This extension of the living wage ordinance will affect 13 hotels on Century Boulevard. The law will increase wages for workers to $9.39 per hour with health benefits and $10.64 per hour without health benefits. In addition, the council passed a worker retention ordinance that insures hotel employees will be able to keep their jobs 90 days after a hotel changes ownership. City lawmakers also enacted rules requiring hotels to give service charges imposed on banquet guests to servers. The Los Angeles Times reported that current average earnings for Century Boulevard hotel workers is 20% lower than those in downtown hotels and 22 percent lower than in East San Fernando Valley and Burbank hotels. Low wages at Century Boulevard hotels contribute to poverty in the nearby communities of Lennox, Inglewood and Hawthorne, where a large number of these workers live. Local news media report that in the last two years occupancy rates at Century Boulevard hotels has increased 16 percent -- the highest in L.A. County. The hotels are doing very well. "Today's historic vote is a win-win for everyone," said Councilman Bill Rosendahl. "The living wage for the hotel workers is a matter of social justice, as well as a matter of good business sense. Treating workers fairly and improving working conditions will benefit hotels and drive economic activity along Century Boulevard. Today's vote will help all boats rise together." I agree with the Councilman. And, I applaud the hard work of Council member Janice Hahn, one of the driving forces behind the new regulations. I'm not sure who it was who first said it, but I agree completely with the familiar line, "The very best program of social uplift possible is a job that pays a living wage!" Like I said, David Shipler should be very pleased. Saturday was a day with grandchildren! Here's how bad it is. At 8 a.m. its delivering donuts to the home of our oldest grandchildren, Gracie and Wyatt. Nothing better than those early morning smiles and hugs, followed by sugary fingers and kisses! Then, it's a drop in to see our newest grandson, Owen. He is serious as a judge and growing like a weed! I managed to coax several smiles out of him. He watched me for the longest time, I am sure trying to figure out who in the world the crazy old guy in the baseball cap might be! What blessings these children are to everyone who knows them! Sunday I will speak at the Preston Road Church of Christ (PRCC). This is the church that led the way in founding Central Dallas Ministries. Thanks to the dreams and vision of Jim and Betsy Sowell and the pastoral leadership, guidance and teaching of the Senior Minister at the time, one of my very best friends, Randy Mayeux; this church provided the creative space for the formation of the community-based non-profit where I get to work every day. Obviously, this is a very special group of people to our organization and to me. Each year about this time, I enjoy the privilege of addressing the church. The church in turn shares a special offering of love and compassion with us. This offering is above and beyond the annual support we receive from the church's operating budget. I am grateful for every person who is part of this congregation. Not everyone likes what we do or plan to do. On Tuesday, the day after our closing, The Dallas Business Journal posted a report on the progress we've made on our CityWalk @ Akard project. Although I applaud your interest in meeting the needs of Dallas County's poor, I read with horror the news article in the Dallas Business Journal today regarding the purchase of a downtown building to house low income and homeless persons. Now that we're finally seeing some improvement downtown, including luxury condo development, you want to offer downtown housing to bums, crazies and drug addicts. I noticed that 9 units will be priced at market value. Who in their right mind would rent an apartment in a tower of homeless people? For that matter, how long do you think even moderately poor people will stay in your building? I guarantee you that the building will be trashed and the project declared a failure within 12 months of opening. Are you even going to rehabilitate the outside of the building? If so, at least some good will come of this Quixotian nightmare. Please consider finding another outlet for your altruism before you stop the progress downtown. As is often the case with critics, this gentleman gets the facts all wrong. CityWalk @ Akard will not be a "tower of homeless people." Fifty units of the 209 will be leased by formerly homeless persons. This ratio is well below some of the best national models. To be clear, we wanted the ratio to be closer to 50%, but the Mayor and City Council had other ideas. I respect this fellow's right to express his point of view. But, as I know you would expect, I couldn't disagree more. It is clear he personally knows no one who is poor or homeless. If he did, his worldview would be much kinder and better informed. Let's hear it for Farmers Branch! How about that courageous City Council in Farmers Branch, Texas? Last Monday evening they voted unanimously to make English the official language of the town of 28,000 and to make it illegal for apartment owners to lease housing to those who could not prove that they were legal residents of the United States. The council also authorized the city's police department to seek special training so that the immigration status of persons in custody could be determined. In essence, Farmers Branch police officers will become immigration agents. I say courageous because of what they didn't do. Tim O'Hare, the City Council member who got the ball rolling on this aggressive "reform" movement, wanted his fellow council members to penalize employers who hire undocumented workers. He also wanted funding cut off for youth programs serving undocumented children. I guess apartment owners--there are only 15 apartment properties in the town--are an easier, less politically volatile group than business owners who have grown accustomed to the hard working, low-cost labor force that lacks nothing but proper documentation and increased opportunity. And, really now, only the Grinch who stole Christmas would have the gall to crush summer programs for little kids, don't you think? There is so much to get at here, I truly don't know where to begin. But, let me give it a shot! First, I thought municipalities were about potholes, public safety, parks, libraries, economic development and civic pride? When did immigration control become a local issue in a small town like Farmers Branch? I know, I know, the feds aren't doing their job; but wouldn't it be more productive to lobby the U. S. Congress than to punish a segment of the population inside the city limit signs of just one place? And by the way, what message has the United States' enforcement policies been sending for well over a decade to persons south of our border who simply seek an opportunity to better life for themselves and their families? How about the message of the millions of employers who have hired these workers, even in Farmers Branch? In my view, President Bush's comprehensive plan to deal with the millions of undocumented immigrants through a guest worker program seems on the mark. Securing the borders going forward with stepped up security and by negotiating with the Mexican government as a part of the plan also seems prudent. But the notion that we can simply kick out 12 million people is ludicrous. Just here I remember the 500,000 people who march peacefully through Downtown Dallas on Palm Sunday last April. The politicians who exploit this issue to arouse a fearful, uninformed public for their own political benefit should be ashamed. None of us should pay any attention to them either. Second, much of what Mr. O'Hare and his colleagues claim is simply not true. Let's be very, very clear: Undocumented residents of Farmers Branch do pay taxes. No one escapes sales or property taxes. Anyone who buys anything pays sales tax. Anyone who pays rent contributes to the property tax bill paid by the property owner. Then, there are Social Security taxes that millions of undocumented workers pay into the system annually using bogus Social Security numbers. At last count this amount equaled 10% of the Social Security reserve fund each year. These are tax dollars from which these workers will never benefit. As a matter of fact, these dollars will help fund my retirement, not theirs. The Social Security Administration has no interest whatsoever in seeing this flow of income shut off. Third, what about the economic impact of undocumented workers in a place like Farmers Branch? The service and construction industries draw large numbers of workers from this growing and readily available pool. According the Inter-American Development Bank, 90% of the wages earned in the U. S. by immigrants stays here. During 2006, immigrants will contribute over $50 billion to the Texas economy--again, dollars that stay here and circulate in our communities, including Farmers Branch. What about the effect of immigrants on wages for U. S. citizens? According the studies, the impact is negligible. Those most affected are high school dropouts who see wages fall by about 8% because of the competition of immigrant labor, a reality that could be offset by staying in school. Arguments about the cost of providing public education and healthcare come across as disingenuous to me. Working to assure the future of all of our children seems to be the kind of public, civic investment that ultimately benefits everyone, and for a long time to come. The labor force is here and it counts in the millions. Making sure every child is learning and growing benefits the whole of our culture and all of our communities. The same can be said for adequate medical care for every resident. Finally, call it what you will and argue with me all you like, we must face the reality of the racism, classism and xenophobia bound up in this extraordinary move. The Farmers Branch City Council has taken action to ban an entire group of people. "Move to Garland, stay in Dallas, go to Denton, but understand us: you are not welcome here because of who you are and where you are from." I find this action shocking and abhorrent. But on second thought, maybe it's not so surprising, especially for a person like Mr. O'Hare. I'd bet you a dollar to a hole in a donut he has his eye on the Texas House of Representatives and beyond (see comments above about politicians who exploit the fears and prejudices of voters). Ironically, O'Hare and three of his fellow council members attend the same large and influential church in Farmers Branch. So, I assume they consider themselves to be people of faith. I expect that the other two members of the council also attend church. It makes me wonder if they are reading the Bibles they likely will carry with them into their houses of worship this Sunday. After all, the message of this book is really fairly clear on the subject of how to treat immigrants. "Do not mistreat or oppress a foreigner; remember that you were foreigners in Egypt." Exodus 22:21. I'm thinking the Farmers Branch City Council needs to reconsider its action. Each year the United Way of Metropolitan Dallas conducts a "community needs assessment." Each year the direction and scope of funding for programs is largely determined by this study. Reading the report thrashes me every year. I feel ripped back and forth from depression and despair to rage, with lots in between! 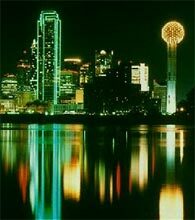 Consider just a few facts of life for children who live in Dallas, Texas, one of the most affluent communities in the world. Over 17% of the families in Dallas live at or below the poverty line. The percentage of our neighbors who live in poverty has risen from 13.5% in 1990 to 17% today, while our population has grown dramatically. Dallas has exceeded the state's average for percentage of impoverished families. Fully half (50%) of Dallas' impoverished population is under 18. One in four (25%) children under 5-years-old are poor in Dallas--up from 1 of 5 (20%) not long ago. Twenty-two percent of those in poverty are between ages 5 and 17. 39% of female-headed households that have children are living in poverty. What kind of city accepts such harsh realities for its families? Upon reading some of these grim facts about life in Dallas, Jeremy Gregg, Central Dallas Ministries' Director of Development, asked me this question, "What kind of community do we live in, where our wives would have nearly a 40% chance of living in poverty if we were not here?" He went on to say, "I think of my daughter growing up in Dallas, and I imagine the various paths that would lead her to become one of our neighbors. More and more, I realize that her future depends less on the choices that she makes than on the choices that Natalie and I make." And, I would add, the choices that our community's leaders make. I would also want to discuss just how the opportunities afforded individuals and families are spread out over our community. The inequities remain absolutely glaring. Charles Senteio, another colleague of mine here at CDM who directs our Institute for Faith Health Research-Dallas, keeps saying that "people matter." But until we begin to act as if they do, the message is lost, inauthentic and simply a cruel charade. We have a long ways to go to turn this around. And, there is no time to waste. The close. . .at last! Late yesterday the deal closed on 511 N. Akard! CityWalk @ Akard has been acquired! As a result, over 200 low-income, working citizens of Dallas, Texas will soon be able to lease high-quality studio apartments very near their Downtown employment. Of these, 50 individuals who are on the street today will be able to move into homes of their own. I am grateful to John Greenan, Executive Director of the Central Dallas Community Development Corporation, for his leadership, vision and hard work to see this project through to close on the acquisition. John (along with his team that includes Johnice Woods, Lori Beth Lemmon-Harrison, Tom Milner, Rob Colburn, Mark Joeckel, Central Dallas CDC and CDM Board members and staff, and a number of other community partners, leaders and professionals) worked tirelessly for over a year to guide us to this wonderful moment! Now we begin the process of closing on the construction loan that must wrap up by the end of March 2007. Much hard work with our architects and other partners remains to be done. But, we will get there! The CityWalk @ Akard initiative will change the landscape in Downtown Dallas for low-income working people. Today we are much more than grateful! Thanks to each of you who have been so faithful in remembering us. 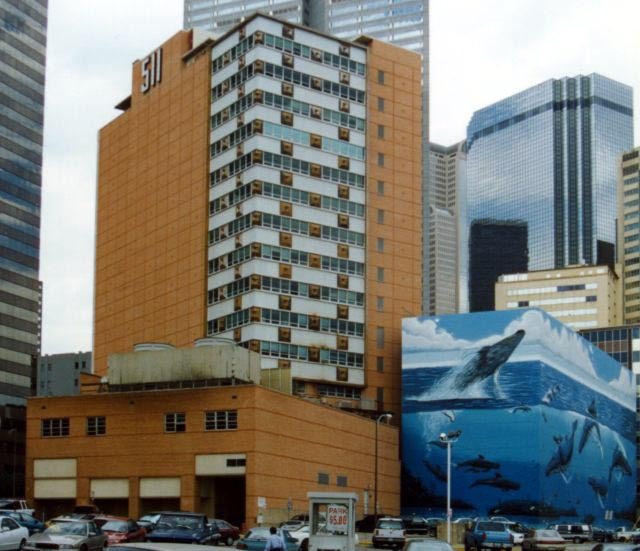 Based on everything we learned last week, including a "down-to-the wire" attempt to close on our 511 N. Akard building acquisition last Friday, we are all set to finally wrap up the next step of our largest and most important project to date. If things go as we hope, by the end of the day the Central Dallas Community Development Corporation (CDCDC) will own the building that we plan to redevelop into 200 units of high-quality, workforce housing for our low-income neighbors, including 50 formerly homeless men and women. In addition, the project will offer nine market rate apartments, as well as retail and office space for lease. We've been working on the deal for well over a year. The next incredibly big step is right before us. Dallas needs this project to be successful. Over the past week I have noticed a number of people whose lives appear to be as out of control as mine. There was the woman early Wednesday morning on her way to work, I suppose--it was still dark. She drove down Peak Street toward Central Expressway at break-neck speed while trying to apply her makeup, including mascara. How do you manage the bumps on a street in such terrible condition with a sharp object that close to your eyeball??? A bit later in the week I drove up behind a guy in an overloaded SUV--looked like the rear was packed with softball equipment. He was driving with one hand down an incredibly crowded service road. In his other hand he sported an electric razor. He was shaving on the way to work or wherever it was that he was headed. He seemed to be doing a great job, though I'm not sure how he could see the road with his head thrown back so far as he worked on his neck! Multi-tasking is out of control in my life. How about you? Where is the Sabbath rest we were commanded to observe in childhood? I've never been an advocate of placing the 10 Commandments in public places, but maybe I've been all wrong! Am I the only one who is facing the fact that we need some down time? Some simple rest? Why do we keep packing more and more activity into the same, increasingly cramped schedules? With each new efficiency we don't find a way to rest, we simply shoehorn more into our days. When you answer, please speak up as I'm listening to Meet the Press, brushing my teeth and glancing at the morning news while typing and getting dressed for church this morning. Tightrope Act or Balanced Walk? Ever feel as if you are walking across a tightrope or on an extremely narrow ridge as you traverse your life? Do the conflicting challenges and warring obligations sometime seem overwhelming, threatening to throw you completely off balance? Can you see yourself rolling down the steep embankments to your left and right? I suppose this is the nature of life for a growing number of us as we rush and struggle our way through day after day. That is one way to view the image here--a tightrope balancing act. But, take another look. Can you see something else here? If you lift your eyes from the very narrow ridgeline to the figure's feet, legs, arms and hands, the image changes, doesn't it? What we are seeing here is balance at its best. I guess it all depends on how you look at the challenges and the difficulties, what do you think? When I speak of balance, I am not talking about a comfortable walk down the middle of the road. No, not that. The edge, the sometimes radical edge is still very present. But the balance comes with focus, selflessness and simply allowing oneself to be lost in the walk itself--a walk complete with beauty and conflict, peace and turmoil, growth and decline. Maybe the secret is to keep our eyes trained on the light just ahead of us. 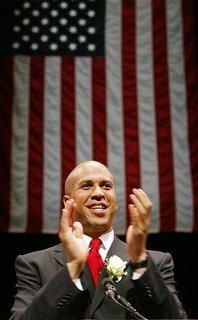 Is America ready for Cory Booker? Booker is a Stanford University graduate (where he played on the varsity football team), a Rhodes scholar, a Yale-trained attorney, a former Newark, NJ City Council member and now the Mayor of that city. Booker comes from upper-middle class roots. The son of two IBM executives, he grew up in the affluence of Harrington Park, NJ. He starred as an all-state football player at two positions in high school. He served as his high school class president. He and his older brother were the only black kids for miles. While at Stanford, he was elected class president again. He'll tell you that his parents taught him two lessons that have shaped his life and his career choices. One, because of the privilege you enjoy, you have an obligation to give back. Two, the struggle to move into the middle class in racist, white America was no small accomplishment. The combination of these two parental directives explains a lot about Booker today. While at Yale Law School, Booker moved into a boarding house in the roughest part of Newark so that he could be close to the people of the inner city. Booker spent his summer vacation in 1999 camped out in a tent that he set up in the garbage-strewn parking lot of a Newark housing project to draw attention to the deplorable conditions. As a result of his efforts and the publicity they attracted, the 550-unit Garden Spires apartments were dramatically improved. In October 2006, Booker published "The First 100 Days," a report on his comprehensive strategy to revitalize Newark that outlines. . . It is quite a plan. But then, he is quite the leader. His unique commitment and perspective have contributed to the passage of strong laws designed to protect the poor. Thanks to his efforts, slumlords do jail time if they repeatedly fail to make their properties habitable. 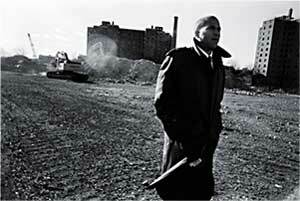 Today, as he provides leadership for Newark, Booker resides in a public housing project among his city's poorest people. I have a feeling that the public policy coming out of his office and from the Newark City Council under his watch will be groundbreaking and just what his city needs and what the whole country should pay attention to. I saw him again earlier this week. The slight, muscular man with a sharply lined face peddled his old bicycle down the street a block from my house. What was different this time was the old, creatively modified golf cart that he had attached to his bike allowing him to haul a huge plastic bag of aluminum cans he had collected from the street. The determination on his face impressed me as he transported his treasure to the recycle drop off center where he would cash in what he had amassed. I remember a conversation I had with this gentleman about this time a couple of years ago. I stopped him on the street and invited him to enjoy a Thanksgiving meal with us. "I don't take handouts," he informed me. I tried to explain that there was no handout involved, just a community meal. He would hear nothing of it, continuing to insist that he took care of himself and needed no assistance, thank you very much. As I watched him ride away, I wondered what it would take to provide this gentleman a better opportunity. His problem is not that he doesn't want to work. It could be that he has limited skills, or he may be dealing with mental illness or addiction (though I doubt the latter), or he may have a criminal record that blocks his full employment. What I do know is this, we should be doing better by him and with him for our own sakes. But our system in Texas and Dallas is so limited, so under-developed, so broken, random and thoughtless. There should be a way, a port for this guy to dock into, not for a handout, but for a chance to move forward. He is surviving, and better than most, thanks to his creativity and persistence. I wish him well. I just think he deserves more. Poverty and the unforgiving nature of life. . .
Life can be very unforgiving at times, especially if you are poor. If you are living in poverty, the impact of your mistakes tend to be magnified, often beyond what the rest of us can comprehend. A few days ago I had lunch with a very poor man. He lives on the streets of Dallas. He is clean, sober and looking for work. I first met him several years ago when he appeared at my office door holding the side of his face. An abscessed tooth was about to take him out. He was angry because he had been trying for days to get help. Again and again he had been frustrated. The pain increased his anxiety and fed his growing rage. We were able to get him the relief he needed. We talked about that day over lunch. His situation got me to thinking. Poverty can make life very, very unforgiving. What would you do if you woke up tomorrow with a toothache? I know what I would do. I'd call my dentist and be on the road to recovery before nightfall. I'd come home from my dentist, pain medication and antibiotic in hand, and I'd go to bed. I'd enjoy soup and ice cream and I'd be back at work the next day. My friend doesn't enjoy such luxuries. He did get his tooth attended to, but I bet the 24 hours following the extraction was not pleasant for him. The memory of his toothache made me think about other situations in my own life when I have made really dumb choices, but found almost instant forgiveness thanks to all of my blessings and benefits. When I was about 16-years-old, me and my best buddy loaded my 1957 Buick (the car my dad had turned over to me when I started driving) with camping gear for a trip to the woods. We also stopped down in Vickery and bought plenty of beer and bourbon! To make a long story short, my ever-vigilant father caught us! He dealt with me in a way that forced me to face my stupidity on my own. He couldn't have handled my failure or my bad choice any better than he did. My mistake didn't lead me deeper into destructive life choices. I found life forgiving because of my parents on many occasions. I'm not at all sure that my homeless friend enjoyed such benefits when he was growing up. Not every benefit is tied to economic status or class. But, many are. The stability of middle class life, played out over several generations, delivers advantage after advantage that can turn many mistakes into opportunities for learning and growth. A person with a stable family, good options for education, employment prospects and the expectations of success enjoys tremendous advantages. I have found life to be a fairly forgiving experience, not because of my superior intelligence, wisdom in decision making or personal morality, but because of a number of built-in advantages that have simply been given to me. It is hard for me to withhold forgiveness when I have received so much of it myself. 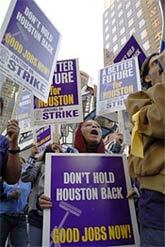 Have you been following reports on the now 2-week-old strike by janitors in Houston, Texas? I saw the latest report in the papers this past Sunday. The Service Employees International Union (SEIU) organized the strike that last week shut down one of the busiest intersections in the city. Obviously, one purpose of the strike is a call for higher wages and more hours. The workers seek wages of $8.50 an hour, more guaranteed work hours and medical benefits. But, this strike seems to go beyond these traditional aspects of a labor agenda. Respect for human dignity is central to this labor action. According to Stephen Lerner, director of SEIU's national Justice for Janitors campaign, "The strike here is about thousands of workers being seen as full human beings, full participants in the life of our country. Are we going to lift the poor up or dig in and start pushing them further into poverty?" Important question, at least I would think. Beyond this, the strike is evidence of the growing connection between labor unions and immigrants. SEIU represents over 5,300 janitors in Houston alone. Most of these workers are female immigrants. The union in this case has worked very closely with community organizations and churches that serve this segment of the city's population. The strike against the five largest cleaning companies began on October 23. Houston janitors make an average of $5.30 per hour, are limited to part-time work and receive no health benefits. One contention of the union is that employees of the same companies working in Philadelphia, Los Angeles and Chicago earn more than twice this amount and receive health care benefits. A report in The Dallas Morning News ("Houston janitors' strike goes deeper than wages," Sunday, November 5, 2006, 3A) tells the story of Mercedes Herrera. Ms. Herrera has worked as a janitor for 5 years. She earns $5.15 an hour and is allowed to work only 4 1/2 hours a day. During her short shift, she is expected to clean nine floors of a downtown office building, including 18 bathrooms! "This is a struggle we are all involved in because we are working for a cause," she said. "We are not invisible people, ghosts or robots who clean buildings. We have families. We have rights. We are not like toilet tissue that you use and throw away." Compelling story. Lots of courage here, don't you think? It has me wondering. . .
What does faith say about labor? About labor actions and unions? Where is the church and its voice on these issues? My job is more than a hoot! I know that I am very fortunate to get to do what I do everyday. This past Thursday, as is always the case on the first Thursday of each month, I attended the November edition of our Urban Engagement Book Club. Randy Mayeux, my longtime friend and "partner in crime,"did his usual masterful job in providing a thorough synopsis of yet another important book, Michelle Kennedy's, Without a Net--Middle Class and Homeless (with Kids) In America: My Story. Each month we all leave feeling as if we have read and digested another significant book that addresses some aspect of social justice, public policy and/or chronic poverty. These meetings are very helpful and extremely unique. I'm not sure there is another group like this anywhere in the country. If you know of one, please let me know. We are exploring plans to offer these meetings in additional locations around the Metroplex and in other cities. The conversation is always amazing. The reason is not hard to find: the diversity of our group. Ministers, business leaders, public officials, teachers, volunteers, social sector workers and the homeless gather for a light meal and for the stimulation of Randy's presentation and our discussion. I know of no other public space in Dallas where homeless persons take the floor and instruct those with homes about the realities of their lives on the streets of our city. Nothing trumped up here either. Just a meal, a book and a conversation. We have been doing this for over two years and community is forming. I know that a number of the studio apartments in our new Downtown building will be taken by some of the participants at our book club. I also know that the intelligence of these very poor persons is informing our plans and the hearts of all who show up each month. If you live in Dallas or if you are here on a book club day, join us. You won't be disappointed I can assure you. 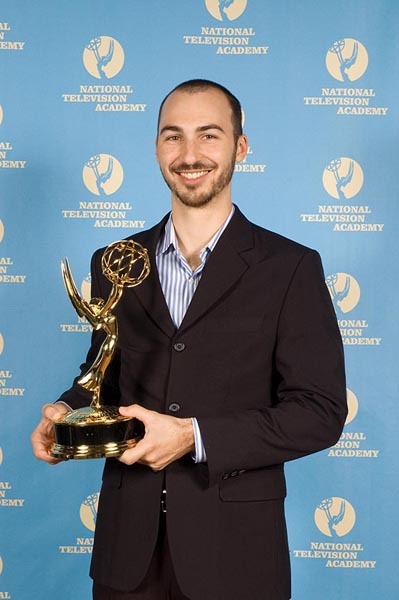 Matt Hopkins and his group at Viacom in New York City just won an Emmy! Matt is the son of my best friend, Dan Hopkins. For years Dan and I have been running around our neighborhoods and at our common meeting place these days, White Rock Lake. Over all those miles, a common topic of conversation across the years has been our children. To say that Dan and all of us who know Matt are pretty proud would be the understatement of the century today! Matt works in marketing for Viacom and he led the team that produced the Public Service Announcments on HIV/AIDS that won this prestigious award this year. Matt blows the top off when it comes to talent and smarts. He graduated from Boston University with a degree in performing arts or theater--I'm not sure what the folks at BU label it. Suffice it to say, Matt is a rare talent. He has produced several original plays off Broadway, his latest receiving rave reviews from the New York critics, as well as another important award, the name of which I cannot recall! I had the privilege of attending a play he produced and performed in a couple of years ago and it was amazing--funny and brilliant! And now, the Emmy. . .
What important, compassionate, relevant work! Frequently at this site, readers lecture me about how the church, rather than the government, should care for the poor. I know we will continue to debate this point in the future. Not long ago a friend sent me a link to an extremely interesting article by Ray Mayhew ("Embezzlement: The Corporate sin of Contemporary Christianity?"). I found Mayhew's ideas compelling. What follows are a few quotes for your consideration. While reading some patristic documents recently, I was startled to discover that the Church Fathers are univocal in their insistence that the bulk of the revenue collected by a local church belonged by right to the poor. There was no expectation among them that a large percentage of what was collected by a local congregation would be used for its own maintenance and ministry. In fact, to do so would have been viewed by them as a misappropriation of funds. . . .
. . .the assumption of most church leaders today is that we have the right to spend our revenue in ways that we believe would be most beneficial to the work for which we are responsible. Budgets are drawn up, employees paid, buildings built and maintained, and missionaries supported. This is the way things are done, and as long as there is an annual audit and no misappropriations of funds, all is well. But is it? All of the above is built on two assumptions that are rarely, if ever questioned. The first is that revenue collected is "ours," belonging by right to the congregation that gave it and who now, therefore, has the right to spend it. The fact that some churches tithe their income and give away ten percent to other ministries only reflects how deeply we believe it is "ours" to use in the first place. The second assumption is that how this money is spent is a pragmatic decision that varies from congregation to congregation (and culture to culture), depending on the perceived needs and objectives of each local church. I believe that both of these assumptions need to be reexamined in light of scripture and church history. . . .
. . .The record is unambiguous, church revenue, prior to Constantine, was used, both locally and in other parts of the Empire, primarily for the welfare of the sick, the poor, the imprisoned, the widow and the orphan. The local congregation did not expect a large percentage of what was given to be used for its own maintenance and ministry. In fact, to do so would have been viewed by most of them as a misappropriation of funds. In the second century, Tertullian provided us with details of the church services in North Africa. He spoke of every man bringing money. . ."You might call them the trust funds of piety. They are spent on the support and burial of the poor." Justin Martyr provides us with similar insight from the second century practice of the Roman church. Speaking of the Sunday service he says, "the money thus collected is deposited with the president who takes care of the orphans and widows and those who are in straits because of sickness or any other cause and those in prison, and visitors form other parts. In short, he looks after all who are in need." 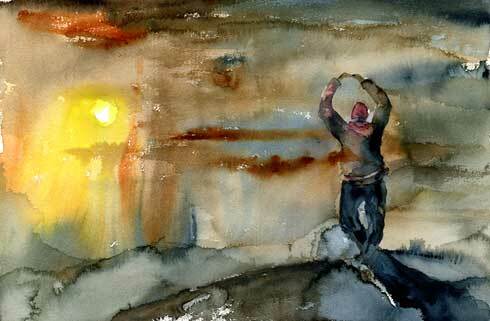 . . .Giving in this way was not seen as generosity, it was viewed as an act of restitution. It belonged to the poor by right. Augustine instructed his own church to set aside at least a tenth of all their possessions and income for the poor (not the church). This was actually a concession to what he saw as greed because his congregation was not prepared to give up everything that was "superfluous"! . . .We should also not miss the obvious: when the Old Testament tithe was given, it was given away to others. It was given to the Levites, a tribe to which those doing the giving did not belong. In contrast, when I give to the church, it is not "given away" at all. I am the church! Revenue given to the church directly benefits me as a believer in providing pastoral care, Bible teaching, family counseling, facilities for my children and a building for me to worship in. In that sense, very little is given away. Most of the money I give to the church is spent by the church on meeting my needs and those of my family. For this I am very grateful. However, I am also suspicious as to whether I am a valid recipient of such expenditure. . . .Today, if we are going to teach the tithe as a benchmark of faithful stewardship, we need to also teach how the early church used these trust funds in ministering to the needy. . . .In the late fourth century, John Chrysostom echoed Matthew 25 in lamenting, "thou hast been bidden to give freely to the hungry. . .but thou dost not count him deserving even of a loaf; but thy dog is fed to fullness while Christ wastes with hunger." . . .Cyprian maintained that prayer and fasting was of no avail unless accompanied by giving to the poor, while Origen ranked almsgiving third in importance behind baptism and martyrdom. However, their definition of almsgiving went far beyond giving their loose change to the hungry and homeless. It was defined as spending on oneself only that which was absolutely necessary and giving the remainder away. Nothing superfluous should be kept as long as others lacked the necessities of life. . . .Ignatius characterized heretics as those who had "no care for the widow, the orphan, the oppressed, the hungry or the thirsty." Lots to think about here for church people, huh? Read the essay in its entirety at: http://www.relationaltithe.com/EmbezzlementPaper.PDF?PHPSESSID=a51c2cdedd075fbce8b57263389f9007. Often positive personal choices and the impact of good decisions can be swamped by the living environment of the individual who is trying hard to do better, get better and improve the quality of his or her life experiences. Outsiders find it very easy to focus on "personal responsibility" as the cure-all for most social ills facing inner city communities in the urban centers of our nation. But, you know what? It is just not that simple. Recently, I attended the second annual meeting of the J. McDonald Williams Institute here in Dallas. Don Williams, former President and Chair of Trammell Crow Company and founder of the Foundation for Community Empowerment (FCE), has done more than any other one person to help our city understand the reality facing individuals living in our poor, depressed, ghetto neighborhoods. But, Don and FCE have intentionally gone well beyond a limited focus on individuals. That is because they understand the forces controlling urban reality. FCE is doing in-depth research census tract by census tract in the neighborhoods of the entire Dallas community. The report issued at this year's annual meeting laid out a "wholeness index" delineated along a 12-factor statistical continuum that graphically displays the glaring disparities that exist in our community between the north and the south. Pick you indicator--SAT scores, graduation rates, income levels, housing, crime, life span, access to retail shopping, voter turnout, wealth, school holding power, occupancy rates in rental properties--the environmental differences created by the disparities that exist between North Dallas and South Dallas is simply overwhelming. You can find the full report at: http://www.thewilliamsinstitute.org/Portals/10/Wholeness%20Index%202006%20-%20Summary%20Report%20-%20Released.pdf. I urge you to read the full report. We will never be able to even begin to address poverty, and all of the problems associated with it that adversely affect individuals, until we come to grips with the structural evil resident in our communities that insure its continuation. It's just not primarily about individuals and their choices. The environment created by dense, generational poverty severely limits possibilities for individuals. The systemic, structural realities facing poor neighborhoods present challenges that often turn out to be insurmountable for the individuals involved. To turn and blame the victims of this environmental reality for their failure to perform is not only shortsighted and uninformed, it is foolish if our goal is to see our communities renewed. Malcolm Gladwell noted in his best-seller, The Tipping Point, that a child raised in a great family residing in a terrible neighborhood has a much smaller chance of success in life than does a child raised in a terrible family that resides in a good neighborhood. If our goal is to move individuals out of poverty and into opportunity, it is simply not enough to focus on the individuals involved. We must learn to attack the disparities that exist across the neighborhoods and in large sections of a city like Dallas. Don remarked at his conference that the Dallas story is actually "a tale of two cities." He had the hard, undeniable data to back up his analysis. Now we must go to work on establishing equity where it is obviously lacking. On Tuesday of last week, the World Affairs Council (WAC) escorted a delegation of guests from Azerbaijan (formerly a state inside the Soviet Union) to Central Dallas Ministries. I am continually amazed by the opportunities we enjoy here to meet fascinating new friends, literally from around the world! We enjoyed lunch and what turned out to be a three-hour conversation about poverty relief and the challenges of economic revitalization. Azerbaijan has a population of approximately 8 million. Of these, 65% live in poverty. One million are refugees who have flooded into the nation because of the war with Armenia. With Iran on the south and Georgia and Russia to the north, Azerbaijan is an important gateway to the Middle East. The group who visited with us numbered 12, including one translator and the host person from the WAC. All but one of the ten national leaders were Muslim. We enjoyed a lively conversation, to say the least. 1) These were very gracious people of deep faith and amazing courage. They wanted to understand us and they wanted us to understand them and their challenges. 2) Their faith was extremely important to them, and it was very clear that they respected us for our faith as well. More than once they took pains to make clear that their understanding of religion was all about bringing people together and not tearing people and nations apart. It struck me that any effective conversation with this group or others like it would always need to include the faith dimension. 3) They wanted us to know that they did not believe in terror or terrorist attacks. "Nothing is ever settled by shedding blood," one remarked, as all nodded agreement. They expressed hopes that the United States would soon end the war in Iraq, a conflict that serves no positive purpose from their perspective. They also asked what our opinion was of nations that harbored terrorists or supported states that did. 4) They shared with us their desire to see life improved for all of their people. They shared with us that the U. S. denies them the aid their nation needs, while supplying assistance to Armenia, the nation that invaded their country and displaced a million refugees. At the same time, they expressed appreciation for America and its people. They consider themselves to be our allies. 5) They quoted the Quran frequently in regard to the poor and to their understanding of the responsibility they had to care for them with compassion. One of the best ways to express love for Allah is to serve those in need. They loved the fact that at CDM we find ways to involve low-income persons in leadership and program development. 6) They expressed the desire to begin an on-going, international conversation with us once they return home. Of course, we agreed. The Internet is wonderful! 7) They reported on their experience the night before when they attended a Dallas Stars hockey game. One gentleman told us that he yelled so hard for the Stars he had almost lost his voice! I loved the casual and natural way our conversation played out. 8) They asked us about Native Americans and where they might meet some of these first Americans. When I produced a number of Native American artifacts, they went wild! They took photos and talked about those who first lived in this place. I explained that I kept these items around so that we would never forget our national heritage of oppression, invasion and injustice. Humility is a good thing for individuals, communities and nations. When they had gone, I sat in my office and reflected on the visit for quite awhile. In spite of our remarkable diversity, we are all basically the same--we want the same things, long for the same freedoms, work on the same problems and seek the same peace. Getting to know one another seems the key to progress, the doorway to hope and a better day. I look forward to keeping the conversation going with these wonderful people.